Every year, summers have a tendency to appear all of a sudden without much notice about its arrival. Well, the good part of it is that warm summer days are the perfect time to get acquainted with surfing. I’m sure everyone knows someone who surfs or at least seen the joy what surfing can bring so why not and try it out yourself! I will guarantee that surfing will introduce you to a whole new world! The goal of this article is to give the basic knowledge to beginnner surfers when choosing their very first surfboard. Well, beginner surfers should not rush getting the first possible surfboard or a wetsuit available but instead should take their time and choose the equipment according to their experience and future needs. That’s why we have created this post to get you the basic know-how when choosing the best beginner surfboard. You’ll find more gear-related reviews and guides at our website as well. 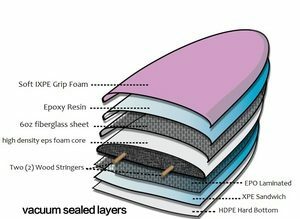 What is the foam-board, soft-top and a longboard surfboard? Which is the best for a beginner surfer? 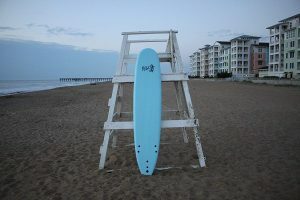 Foamboard – A surfboard that has predominantly made out of solid foam core, making the surfboard soft and safe to learn on for a beginner surfer. Foamboards vary in all sorts of types and sizes, from short 3-feet boogie boards all the way up to 9feet long foamboards. Foamboards have a rather inexpensive construction to most other surfboards on the market. 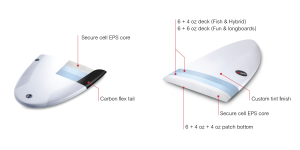 Soft-Top – A surfboard, that is most likely made out foam just like the foamboard. Other words, a foam board – that has a soft decking, which does not need wax for grip. Longboard – A long surfboard, that’s widely used to ride smaller waves by experienced surfers. Longboards are generally expensive and super sturdy compared to long foam-boards. Not to confuse a longboard to foam board or similar board that is long in length. Riding a longboard takes a lot of experience and dedication. A beginner surfer should not start out with a longboard – since it’s a rather over-sized watercraft that must be ridden carefully in the waves! As a beginner surfer, you want a surfboard that’s easy to learn on and what will forgive the beginner surfers mistakes. Luckily, there is the “soft top” technology surfboard, that is large in size and has a soft shell. As easy as surfing might seem, in real life, the large board can be as big of a friend and also an enemy in the rumbling waves so take cautious riding one. The combination of the previous = A beginner surfboard! A Soft Top Longboard is a way to go for a beginner surfer. Best beginner surfboards for sale are found both online and at your local surf store. Not sure about the super-market beginner surfboards, but if you spot a brand that’s been reviewed here – you might get lucky and grab a bargain! What are the best beginner surfboards MADE OF? As the name reveals already – most beginner surfboards are made of foam. Matter of fact, performance shortboards, and expensive longboards have the foam core as well – but have a different fiberglass or epoxy coating covering the foam. Unlike the hard fiberglass surfboards used by intermediate and advanced surfers, a soft-top surfboard has perfect buoyancy and safe construction. Why are beginner surfer surfboards made of soft foam? Many beginners are not aware of what the 8feet + watercraft is capable when loose in the surf. Which board NOT TO CHOOSE as a beginner surfer? Many people starting out surfing are eager to choose a surfboard that’s too small for their skill and knowledge. The easiest way to improve your surfing and advance in skill is catching more waves, and the best way doing that is getting a proper surfboard for that. Do not on surf on really shallow waters – Running onshore will break your board or fins easily. Try catching waves on 3ft+ depths. What SIZE beginner surfboard is best for me? Choosing a surfboard for beginner surfer is more about the weight, than the length ratio. Most of the time, beginner surfer surfboards around vary from 8-12 feet in length. What to consider when choosing a beginner surfboard? If you are a slow learner or going to learn surfing on your own: Get a foam board. If you have already learned the basics with your friend or at a surf camp, and really consider surfing – we recommend getting an epoxy/fiberglass funboard. Why? Because a funboard in a decent size can be used on small days as a perfect all-rounder, while as an intermediate surfer – you will “grow out” out of the large soft foam board rather quickly. Another reason to get a foam-board is that you can use it later to invite your friends to surf as well. Speed – Also known as the “Foam Torpedo”, the Verve has speed and precision focused shape enabling beginners and casual rippers alike to easily and comfortably haul down the wave’s face, helping you make the most of every wave you catch. Why is the South Bay Heritage the best choice for a beginner surfer? This surfboard combo includes everything needed to get confident on the surf at a reasonable price. The South Bay Heritage makes great beginner surfboards, and it comes to your door as an “All included” package deal. This means, all you have to do is simply screw in the fins, attach the leash and you can go out there. This surfboard is lightweight and soft, therefore a perfect choice for a beginner surfer. A surf lifestyle brand that has made its mission to make the cleanest, most durable and highest value surfboards on the market that are ideal for entry-level and regular surfers. Why is The Big Softy by Rock-IT the best choice? Rock-It believes in the legendary surf quote: “He who has the most fun wins”. So, they have created a wide range of surfboards to help beginner surfers involve better surfers. Rock-it surf also benefits 2% net profits for the better cause. Why is the Wave Bandit best choice of the list? Good construction: Double maple wood stringers, egg shape. Three fins included. This is a sturdy surfboard for both beginner and intermediate surfers. 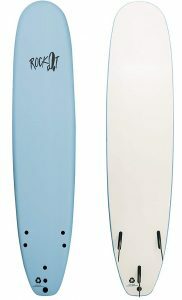 Note, that this board needs a wax – which is a better customization option for intermediate surfers who need more grip at different temperatures. Check out our guide to surfboard wax to find the most suitable one for you. You’ll also need a leash on this combo, but after that, this surf confidence booster by Wave Bandit will get you riding the waves in no time. Wave Bandit specializes in making beginner foam-boards. Some might even say, Wave Bandit is the king of the foamboard surfboards. Wave bandit = Catch Surf. Why is the NSP Protect Epoxy Funboard the best choice for a beginner surfer? This is a perfect board for a true surf enthusiast, who has already learned the very basics of surfing – and is planning to take surfing to the next level. This is a perfect all-rounder board since it works on small waves, is forgiving to beginner mistakes – but is also a perfect funboard for intermediate and advanced surfer skills alike. The Funboard is a better choice over the hybrid fish and a longboard since it is not too big or not too small for a beginner surfer learning to surf. Not to forget the fact that this is an epoxy surfboard, which has a better glide and a stronger build. NSP – New Surf Project has been making good quality boards at a reasonable price since 2001. NSP surfboards are also widely used by surf schools all around the world. NSP surfboards use a ton of different technologies, so innovation in your surfboard will be guaranteed! Why is the Surftech Blacktip the bes surfboard for a beginner surfer? Short answer: This model has been produced for ten years. Long answer: Available in all sorts of sizes and types. The ad also claims to be the most durable and long lasting foam-board on the market. The longest boards on the list make this board the easiest to paddle on. Surftech has been around since 1992. Started out in Santa Cruz California by a shaper named Randy French. By the way, Surftech technologies have been used widely by many famous surfboard brands all over the world! How to take care of your surfboard? If you want to get the most out of your gear, then a proper gear maintenance habits are a must. Make sure you rinse the board after every session and place the surfboard out of the sun. Also, rinsing your wetsuit will keep your gear healthy for a long time! SUP SURFING – Why not get a SUP, a perfect all-rounder in and out of the surf. REVIEWS – Interested at a specific board?